If you live locally, I think its best to come by and try out each wheel before you buy. If you don't live locally, I've listed the specs on each wheel and offered some editorial comments based on my experience with beginning spinners using the various wheels here in classes. Because there are so many brands and then styles of each brand, I don't stock them all. Usually I have a Joy, a Kromski Sonata, a Kromski Fantasia and a Julia by Louet in stock (since those seem to be the most frequently purchased, that's what I stock), but if you want another model that is not in stock I can easily order it at the time of purchase and have it drop shipped. Depending on the manufacturer, a wheel ordered may arrive within a week for most and up to 4-6 weeks for another. 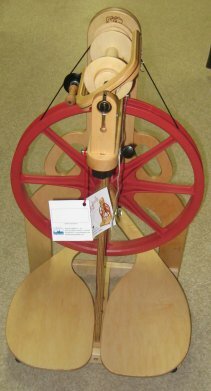 If you live locally and want to order one I don't have in stock, while you are waiting for it, you can take the store wheel by that manufacturer home to spin with until yours arrives. Lady Bug & Side Kick are here! Thru May 30th......you can order a special Elizabeth 30" wheel as part of Ashford's 85th Anniversary celebration....more details thru the link to Ashford above!